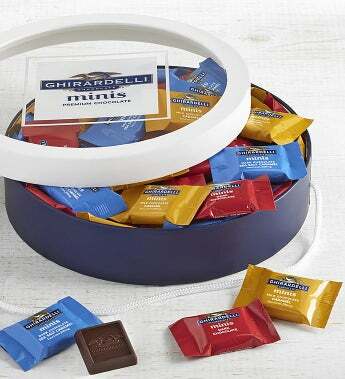 Ghirardelli's iconic chocolate squares in mini size are stylishly presented in this attractive round gift box with a cord handle. Inside, they'll find over a pound of some of America's most favorite chocolates. This 60 piece assortment includes Milk Chocolate Caramel, Dark Chocolate Sea Salt Caramel, and Dark Chocolate. Indulge them with chocolate!